I'm usually a lurker, but I'm coming out of hiding because I'm lost! 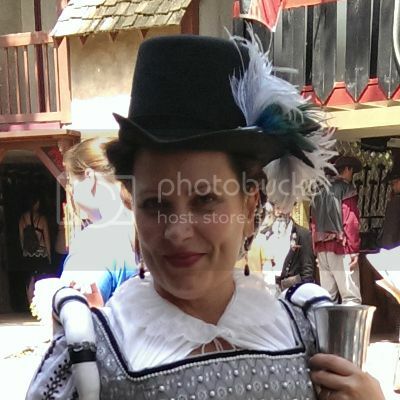 I attend Scarborough, TRF and Sherwood regularly and have other faire visits here and there. I already have two full looks, a pirate and a frost fairy and they are fairly developed personas. I recently acquired some lovely, English noble garb and would at least like to have a name to go with this outfit, so that I may let the persona evolve over time. The garb is not really fitting for Sherwood's time period, so I'm focusing more on Scarborough and TRF's times as my starting point. I've also never had noble garb, so that in itself is something I have to study up on! I'd rather go with something vague-ish rather than 100% historically accurate...I was thinking a fictional persona perhaps based upon a family that actually existed. 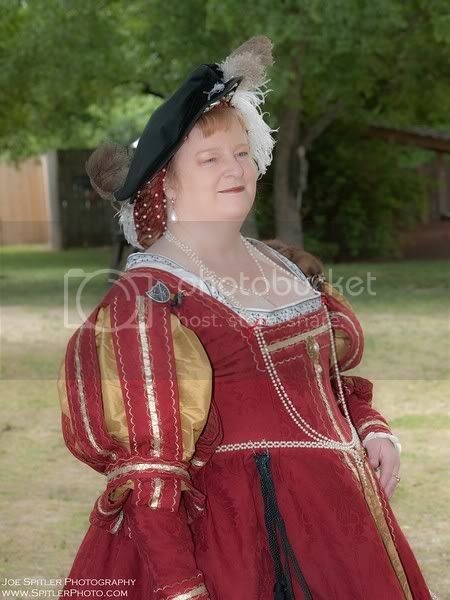 I would also rather this persona be married even though my actual husband doesn't attend faire....yet. I thought about basing my new name around my own real name, but my first name is very unusual and my last name is Norwegian. So, after much deliberation, I thought about going with a common English first name and pairing it with one of the surnames of an extinct Danish/Swedish/Norwegian noble family. I figure that would keep me from stepping on any cast toes and would let my persona remain a bit obscure. Is this too out there? Any suggestions/comments would be greatly appreciated!! Re: New Garb, New Persona! I'm still new to rennie culture (only having been to 1 faire so far), so take what I say with the proverbial grain of salt, but I think that idea is great. That's basically what I plan to do once I have some garb with which to build a persona, using actual historical names just as inspiration for a more free-form, non-descript character. And to top it off, the Nordic/Scandinavian culture is among my favorites for historical fantasy settings, so I'll be excited to hear what you come up with, even if just for the name. Thanks for the reply. Good to hear that someone else thinks I'm on an ok track. I realized after re-reading my post that I left the most important part of my thought process out! By taking an English first name and noble Scandinavian surname, I thought to make my character an Englishwoman who married a Scandinavian. I thought that might be a bit strange, but I suppose stranger things have happened. I also know a smattering of Norwegian..might be just enough to sound like an Englishwoman having to learn a new language. I've done a bit more research today. It seems that the Norwegian nobility was having a hard time of it in the 1500s, as Denmark came in and reduced their standing greatly. However, from what I'm gathering about Sweden, there were a good number of Barons. In 1520 in Sweden though, the Stockholm Bloodbath occurred were 80-90 nobles and clergy were executed for supporting the Sture party. Note to self: Don't support the Sture party! I'm still looking up information on the Danish noble families. There is some really fascinating stuff out there and I'm having to do a lot of searching on sites that are in Danish, Swedish or Nowegian, which is a lot of fun! Danish, Norwegian, Scandinavian nobility has definitely been under-represented. I would be interested to see what your research turns up. Well, in my few days of research, I've come up with a couple of different paths I think I can work with. The wife of a Norwegian baron who is a member of the Riksrådet, or Council of the Realm, in Norway. This was a council that ruled alongside the king until it was abolished in 1536 and was made up of both nobility and clergy. The wife of a Norwegian høvedsmann, a noble who oversaw one of the fortresses in Norway, such as Bergenhus. I'll just have to narrow down which fief the baron oversaw and which fortress the høvedsmann oversaw. I've also decided to use an extinct Norwegian noble surname that's quite close to my actual Norwegian last name...it might not be HA, but it'll be darned close. As a side note, I did find a Norwegian noblewoman named Inger Ottesdotter Rømer who was a real badass in her time. She was the wealthiest landowner of her era, heiress of the Younger Rømer family, and a political intriguer. She was also the inspiration for a Henrik Ibsen play. I am definitely going to be reading more about her. As far as using her for a persona though, I think that might be a bit more to handle and I can't pull off a Norwegian accent to save my life. Sounds awesome regardless of which you choose. If you are going to closing weekend of TRF; keep an eye out for me. I'd like to see what you've come up with. I will be there closing weekend of TRF. I'll definitely watch for you!